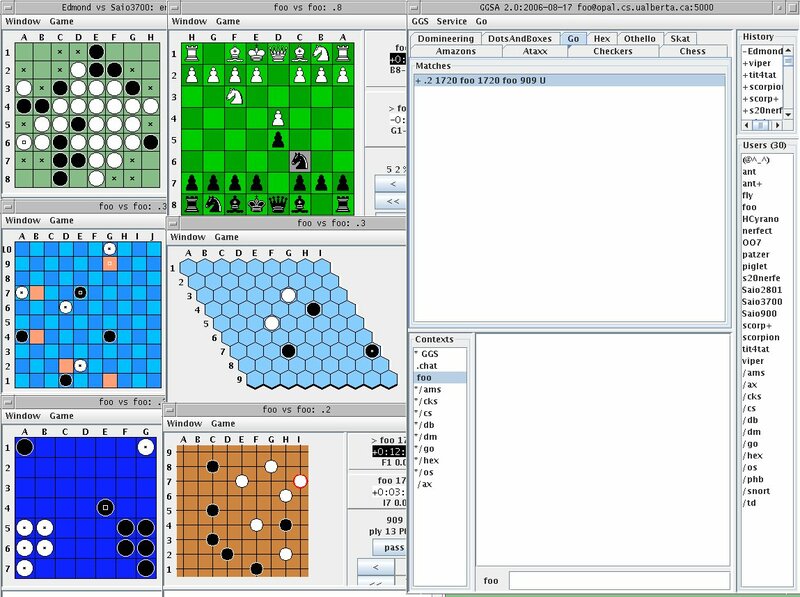 GGSA is a graphical Java client for GGS - a Generic Game Server which currently hosts the following board games: Othello, Amazons, Checkers, Go, Hex, Chess, Dots+Boxes, Domineering, Ataxx, Snort, Phutball and many variations of them. A brief overview of GGS's design goals and GGS commands are given here. Additional documentation can be found below. We are looking for developers of additional GGS game services such as backgammon, poker, bridge, etc. GGSA is free software licensed under the GPL and comes without any expressed or implied warranty. Please refer to the links below for documentation, downloading, and troubleshooting. To get familiar with GGS read the GGS How-To and GGS Intro. Sept.4.2006: GGSA no longer exits when game window is closed. Sept.1.2006: GGSA has been moved to the swing graphics toolkit and restructured to simplify the addition of new service modules. Each service module has now access to its own tab and the default service can now be selected either in the menu or by clicking on a tab. Make sure a recent JDK or JRE is installed on your machine (download at www.javasoft.com). GGSA requires version >= 1.5. Create a new directory and put ggsa.jar in it. Please contact me if you have questions about GGSA or suggestions on how to improve it.